This guide will teach you how to buy Qtum from square one (i.e., all you have is fiat money, no cryptos). It will also work for most other cryptocurrencies, but since I’m writing about Qtum right now, I am going to include a quick foreword about it and then we’ll get right into the details of the guide. A Little About Qtum — Why Buy? There is a massive subset of people who are new to the crypto-space entirely but have only heard of Bitcoin. Then they go online and they search around and figure out there are actually many, many cryptocurrencies out there with many different use cases. For Qtum (ticker symbol QTUM), there has been much interest lately — at the time of this writing, it scores 15th place out of all cryptocurrencies ranked by market capitalization. It should come as no surprise that Qtum was named in a recent Bloomberg article titled “Bitcoin’s Smaller Cousins Are Leading the Crypto Rally” — and personally I believe it’s likely that simple speculation is going to raise the price, at least in the short term, in the wake of this news. However, I don’t write these guides for speculators. Sure, I will look at it from the speculator’s perspective — you have to, if you care about the price — but if you are more interested in the long-term success of a coin, factors such as great fundamentals and useful technology are far more important. For Qtum, the basis of my interest is their willingness to work with business — any coin that can successfully create technologies that are attractive to existing businesses will quickly acquire partnerships, and partnerships with wealthy companies tend to create a massive uptick in the price of that coin. Plus, the QTUM logo is pretty snazzy — of course, I’m certainly not suggesting you should buy a coin based on its optics, but I have to say it is my favorite logo out of any cryptocurrency I’ve seen so far (though Ark has a better overall aesthetic). Getting back on topic, Qtum is described as “The Blockchain Made Ready for Business” on the official site. One could say that Qtum basically boils down to “Bitcoin’s UTXO transactions on a blockchain plus Ethereum’s smart contracts.” Certainly there are other coins that use smart contracts on a blockchain in order to appeal to businesses. This is a winning combination, but what makes Qtum special? First of all, Qtum is a proof of stake coin. If you’ve read any of my other work you should know that proof of stake coins are incredibly attractive to me. They eliminate a part of the centralization that often plagues any proof of work coin, and are less wasteful in terms of the ludicrous amount of power that is spent by cryptocurrency mining groups. Before going any further, I should mention that Roger Ver is listed as an “ANGEL BACKER” in one of Qtum’s introductory documents. Depending on your opinions, this might make you happy or it might turn you away. Ver is a polarizing individual. Personally, I tend to stay far away from the Bitcoin vs Bitcoin Cash debate. Unfortunately, this ongoing argument often devolves into something more political than technical (and that is true of both sides), so I recognize that many people have strong feelings about Roger Ver. With that said, it’s good to be aware of these sorts of things; if you judge a coin by the people associated with it, this is something you should know. Curiously, despite Ver’s support of Qtum, Qtum supports Segwit. This is a little perplexing to me, given some of the politics involved; Ver has been pretty critical of Segwit in the past, to say the least. Of course, this may be an apples-to-oranges situation — Qtum is not Bitcoin. With Qtum, I like the fact that there’s not a lot of vagueness about what you’re getting. Bitcoin-style UTXOs, Ethereum-style smart contracts, Segwit, and staking via its proof of stake algorithm. It’s a very straightforward coin, and this means that its goals seem very achievable. While I’m all for the cryptocurrency wild west we find ourselves in, I have to admit that some other coins have ideas that are outrageously ambitious to the point that it becomes dubious that the project can achieve its aims. Qtum aims for achievable, useful, and straightforward goals. Staking is a concept in proof of stake coins where those who hold coins can receive a sort of “interest” or “dividend” simply from holding the coins. The idea is that instead of miners solving complex proof of work problems in order to secure the network and mining rewards, stakeholders do that work instead. Each coin seems to have a different cute name for “stakeholders” (or, sometimes, an special subset of stakeholders who actually collect rewards). Cardano will call them “slot leaders” and Ark calls them “delegates” but they’re all basically the same thing. With Qtum, though, things are a little different. At the time if this writing, Qtum’s staking system works more like a lottery, and, in my opinion, isn’t all that viable for an “average” user. However, I will go into detail about the process later on. The long story short is that the more Qtum you have, the more likely you are to win coins through staking. I like to finish out my analysis of a coin with a few words about the price and its market capitalization. Ripple (XRP) is currently ranked #4 on coinmarketcap with a market capitalization of $45,188,050,290. If Qtum had Ripple’s current market cap, it would be worth about $612 per QTUM. That’s almost eleven times the current price ($56.65). Now, I know what you’re thinking — QTUM sure is expensive for a relatively low market-cap coin, right? Well, that’s because QTUM has a highly limited supply at this time. According to coinmarketcap, there are only 73,754,408 coins in circulation now — compare that to Bitcoin’s 21 million. What this means is that the coin is going to tend towards costing more per coin than you might be used to, but it also means that as the market cap increases, each coin’s price increases far more than it would for a cryptocurrency with a higher circulation. So, I wouldn’t let the “high” price of QTUM scare you off — it’s all relative. If you’re still with me, I’m betting you’re ready to learn how to buy some QTUM; the process is pretty simple, and I’ll walk you through it. Create and sign in to a Binance account. I recommend Binance because they have been reliable and convenient for me and they offer many different lesser-known cryptocurrencies with trading pairs on both ETH and BTC. An added bonus is that you can withdraw up to 2 BTC/day worth of funds with no verification at all. Alternate exchange options: HitBTC also trades QTUM — I have written a guide to using HitBTC which you will find useful. Move your ETH to Binance. 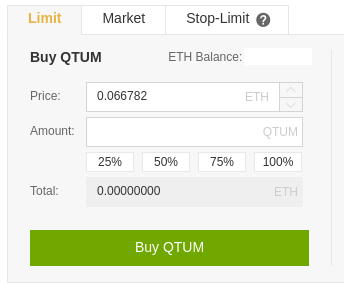 Once it has confirmed, you can now easily use the ETH/QTUM trading pair to buy as much or as little Qtum as you want. More on trading pairs later. Send your coins from Binance to a safe QTUM wallet for long-term storage if you intend to hold for awhile. This is not strictly necessary but it is considered a safer option than keeping ANY coin on ANY exchange long term. Furthermore, as stated previously, QTUM stands out among other coins in that it will reward you with a sort of “interest” for holding. The actual process will be described in more detail later, but know now that you will not be able to earn any interest on your QTUM if you keep it on an exchange. Thus, you are doubly motivated to move your QTUM into a wallet. By the way: it is also possible to store QTUM in an ultra-secure hardware wallet like a Ledger Nano S or Trezor. Once you are up and running there are a number of options when it comes to actually paying for coins via Coinbase. It is possible to link your bank account to Coinbase but actually transferring coins out of Coinbase will be impossible for a few days while the funds are clearing. This is obviously not ideal if you want to move quickly, as you would now have to wait several days to move your coins to an exchange where you can trade them for QTUM (or any other coin). In my opinion if you intend to buy lesser-known coins like QTUM, ETH is the best choice to buy here. Why? Well, with regards to LTC, the reason is clear: other exchanges like Binance offer direct trading pairs for BTC and ETH, but not LTC or any other currency. What this means is that you could directly exchange your ETH for QTUM, or your BTC for QTUM, but you’d have to perform another step if you wanted to trade your LTC for QTUM (and that means more fees!). Obviously we don’t want to waste even one cent if we can avoid it, so LTC is out. Now is the time for you to make your Binance account. Follow the link and create an account using a strong password (this should be different than the one you used for Coinbase!). There are other places where you may be able to buy QTUM (Changelly, Kraken, EtherDelta, HitBTC, KuCoin, etc.). I cannot directly recommend most of these exchanges as I don’t have much experience with them at this point — however, I can say that I have used HitBTC and KuCoin and they have worked well for me. This guide focuses on Binance because my experience there has been 100% positive — I have transferred coins in and out of their system many times with no problems. Once you click Send, you will need to wait a little while. Without getting too technical about it, exchanges want to be as secure as possible. Thus, when you make a deposit, they wait for multiple “confirmations” from the network before allowing you access to your funds. You can view the progress in your Binance account by clicking Funds and then History. Do not be alarmed if nothing shows up at first! There are many reasons there might be a slight delay. In general you should see the transaction show up within a few minutes, with the current number of “confirmations” next to the number of required “confirmations” next to it. Be patient — your QTUM is nearly in hand! Once you have the required number of confirmations, it’s time to trade your ETH to QTUM. This is blessedly simple. In the front page of Binance, click “ETH Markets.” Search for “QTUM/ETH” in this list, and click it. Now you are on the trading page. In the bottom left under “Buy QTUM,” click “100%” below the “Amount” field. This indicates to Binance that you’d like to trade all of your ETH for a commensurate amount of QTUM for no more than the price listed above. The price field is automatically listed based on the current market. If you like, you can change it to a different price, but like any market it’s not guaranteed that someone will buy at the price you’d like. Your order will remain open until it’s been fully filled or you cancel it. There are several options here such as Stop-Limit orders, etc., but this is outside the scope of this guide. In this case, you are simply placing a “Limit” order for some QTUM. If you want to be done now, you can be — but there are more steps if you want to be security-conscious. You may want to check under the “Orders” and “Order History” tabs that the order went through — if you placed a Limit order at the default price, it probably did. Once you have your QTUM in your Binance account, you can see them under “Funds” → “Deposits Withdrawals.” You can click “Hide 0 Balances” at the top to clean up the screen of coins you don’t own, and you can see an estimate of the overall converted BTC and USD value of your account at the top right. In Binance, go into the “Deposits & Withdrawals” tab, then click “Withdrawal” to the far right of the “QTUM” row. By now it should be clear what you’re looking at — fields that let you input the address to send the coins to, and how many coins to send. For your convenience, there is a “Max” button to the right of the Amount field. Note that once you click “Submit” you will need to use your two-factor authentication via Google Authenticator. However, we’re going to need to get a wallet first before we can do this; for QTUM, I used the official wallet which is called Mainnet Ignition. Mainnet Ignition is Qtum’s premiere wallet and can be downloaded from github and is linked from the official site. I refuse to use wallets that aren’t supported on Linux because I believe it’s an indicator that the developers are either very early in their development process, or don’t care enough to truly support their wallet. Qtum, however, is supported on Linux, macOS, and Windows — that’s always a great initial sign. 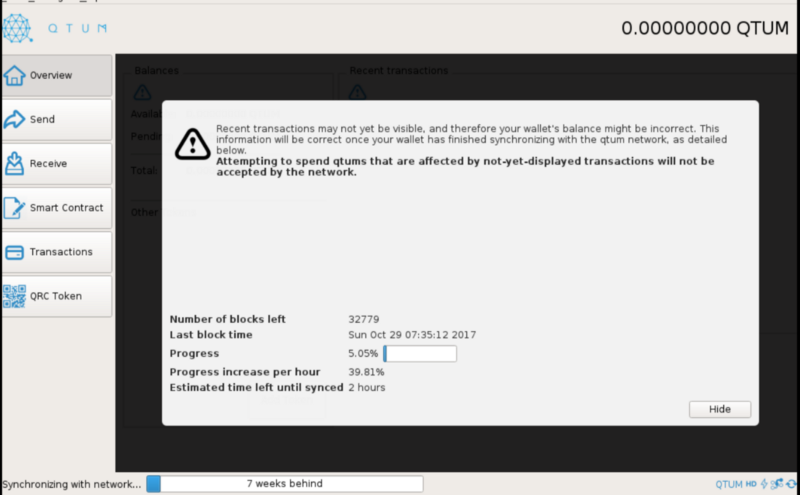 Unfortunately I will say that I had a few issues with this wallet — minor bugs here and there, such as the wallet telling me that my blocks were “corrupted” and that I needed to re-download the chain. This was an inconvenience and I’m hoping that the wallet is improved soon. I did eventually get it running smoothly, though. This might take a little while. Once the blockchain is downloaded, you’re ready to make some transactions. Go ahead and send the QTUM that you bought with Binance. Just click “Receive” on the left side of the Mainnet Ignition wallet, and then click “Request Payment.” Simply copy and paste the line of text next to the word “Address:” when you send your coins out of Binance — this will direct Binance to send your coins into your new qtum-qt wallet. Before we move on to staking, one last point: with any wallet, I like to have a backup. Since this is based on Bitcoin-QT, this is as simple as clicking “file” and then “backup wallet.” This will save a copy of your wallet.dat somewhere — you can keep this on a thumb drive, or, even better, a plain old spinning desk hard drive in a safe. You might also want to write down the master private key itself, but that’s a little outside the scope of this guide. Before you stake your coins, there are a couple things you should know: First, as I said before, staking is based on true randomness in Qtum. Secondly, if you only have a few coins, you shouldn’t really expect to get much out of this process — I read in one place that if you have 1 QTUM, you would expect a reward every 20568.79 days. I’ve even seen people complaining of no rewards at 225 or 1200 QTUM. Compared to the reliability of staking in Ark, this is not so good — and I wonder if staking pools will develop to combat this. Finally, staking in QTUM only works if your wallet is online. While it’s offline, you are not staking and have no potential to earn rewards. This has lead many people to consider using a Raspberry Pi (an inexpensive single-board computer) for their Qtum wallet — of course, you could simply leave the wallet running on your home computer all the time, but it’s often a good idea to have separate machines (whether it’s a computer, Android phone, or hardware wallet like the Ledger Nano S or Trezor) for separate wallets anyway. This basically means you have to wait awhile. In the meantime, you might want to encrypt your wallet with a password via “Settings” → “Encrypt Wallet” — this isn’t necessary, but it is an added security feature. After that you’re going to need to wait 500 blocks for your coins to “mature.” At the time of this writing, that takes about a day. At that point, you are staking any time the wallet is open (and, if encrypted, unlocked for staking purposes). Hovering over the lightning bolt will now give you information about how much you are staking, how much is on the network, etc. My understanding is that you are eligible to receive rewards directly to your wallet at this point, if you are lucky enough to winning Qtum’s staking lottery system. Just remember to keep your wallet online if you want this to be possible! If you’ve followed my guide this far, then you’re the proud owner of some QTUM, and if you like, you are staking it. Be advised that the information here only scratches the surface on Qtum and cryptocurrencies in general. I recommend you read as much as possible. Cryptocurrencies are the future, and if you’re reading this guide you are already lightyears ahead of the curve.